The rain has been falling steadily ever since I woke up. It is a beautiful sound, mostly for its ability to inhibit other sounds, to keep all the other noises I would normally be hearing now indoors, listening to this same noise I am listening to. Yesterday, it snowed all day, light flurries throughout the day. It was probably the first real snowfall of this winter, a pretty depressing statistic. Because global warming has so altered this New York winter, I took advantage of the sadly rare sight of snow and went tramping about in it. 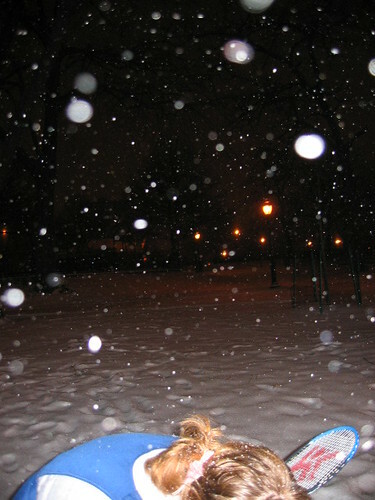 I then got stoned, read some, took an obscenely long shower, and played badminton with Niki in the snow. The sight of snow covering Maria Hernandez park, a fresh coat of paint, made the thing, the park, my neighborhood, my life, seem new and fresh in a very pleasant way. We slid about, chasing after the birdie we kept on volleying to the other, messing up this new coat of paint, exposing the grass in some places, sliding back and forth through the snow. 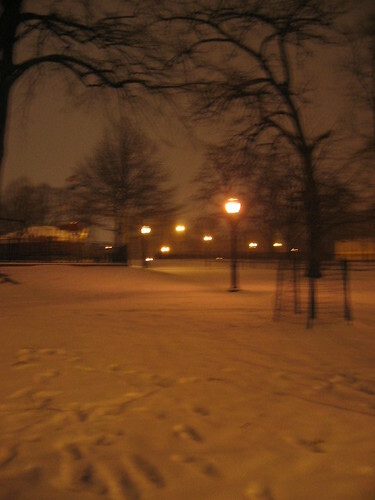 I felt bad, felt that the sight I was privy to, this fresh looking snow-covered park, would not be there for other people, that they would see a trampled sight. The rain has washed away all the snow, such a short-lived thing, and so my worries, as probably usual, were all for naught.